Obituary – Hay, Ellsworth Henry « Perry High School Alumni Association, Inc.
Ellsworth H. Hay, 64, 906 South Brookwood drive, died at 12:45 p.m. Monday at Perry Memorial hospital following a period of ill health the past year. Hay was born May 2, 1906, at Orlando, to Reinhold Gottfried and Elizabeth (Hofmann) Hay. 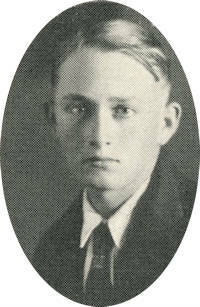 He graduated from Perry high school in 1925 and attended Oklahoma A. & M.
On Nov. 24, 1931, he was married in Perry to Lydia Vogel, who survives. He farmed southeast of Red Rock until one year ago, when he retired. Survivors include his wife of the home; one son, Morton Hay, Perry; one daughter, Mrs Frank Smith, Oklahoma City; and three brothers, Jack Hay, Pawhuska, John Hay, Salem, Ore., and Carl Hay, Wichita, Kan.; two sisters, Mrs. Edith Brown, San Diego, Calif., and Mrs. Violet King, Edmond; and four grandchildren. Services will be at 2 p.m. Wednesday in the First Christian church. Rev. James Lambert will officiate and burial will be in Grace Hill cemetery. Memorial contributions may be made to the Oklahoma Medical Research Foundation for cancer.